If you are a solid fan of President Rodrigo Duterte, you may consider this budget smartphone, a rare Cherry Mobile Limited Edition Duterte Flare J2S. Accoring to the Shopee seller tinabau, Cherry Mobile only produced 3,000 pieces of this limited edition handset. 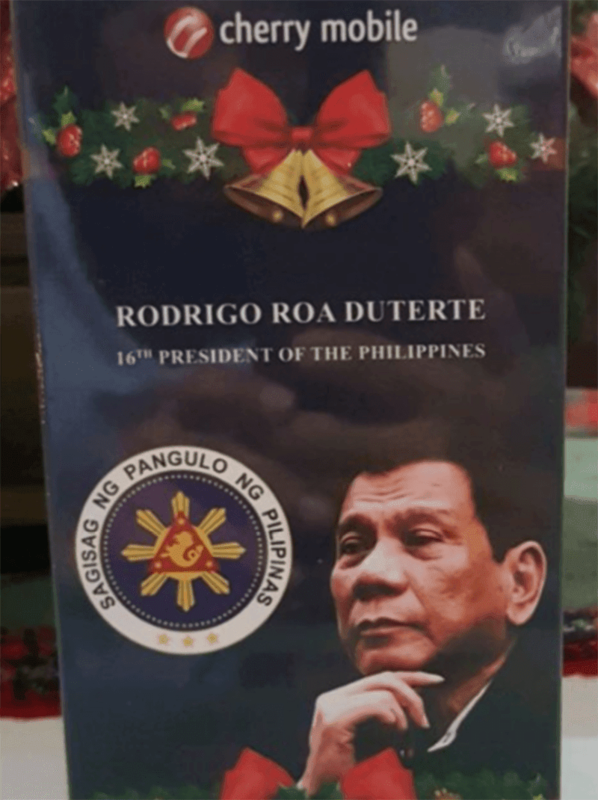 However, aside from its Duterte skinned box with the Presidential Seal, we do not know the other customization Cherry did for this phone. The rest of its specs is the same with the regular Flare J2s. It has a 5-inch HD screen, 1.2GHz quad-core processor, 1GB RAM, 8GB expandable storage, and 8MP primary shooter. However, since this is a limited edition collectible, the price is higher too. From the J2 Prime's original SRP of PHP 2,999, the Cherry Mobile Limited Edition Duterte Flare J2S retails for PHP 4,999. Update: According to Tek Yap of Tekpone Davao, the phones are not for sale to the public. They are gifts from the office of the president. Thanks for the tip John Roland Pamiloza!